© 1998, Washington Square Press. Essential reading for anyone interested in resiliency, thriving, and surviving in adversity. This book is now listed by the U.S. Library of Congress as "one of the ten most influential books in America." This is the current printing of the book orginally penned in the 1960s. © 1999, Jason Aronson, Inc.
"This book deals with the survivors of grief and how they honor their loved ones with their lives. Written for both the grievers and therapist who work with them, this book adds more to the subject of loss, grief and healing than any other.... Thank God someone finally made it OKAY for us to lose a loved one and go on living ourselves! I highly recommend it to anyone who has lost a loved one. It should be manadatory reading for all mental health workers." Review from reader at Amazon.com. Order from WTC Survivors' Network: $5.00 (plus 80 cents S&H) each. To order, send a check or money order to NY Writers Coalition, 80�Hanson Place, #603, Brooklyn, NY 11217. "Every one has a story, and telling that story is a basic human need" is the organizing principle of this booklet of stories and poems. Visit the World Trade Center Survivors' Network website for more information. No book concerning the bombing has so comprehensively addressed the national psyche. This combination of psychological insight and cultural criticism, along with the hopeful assessment of a still-fresh tragedy, will attract a wide audience. "This book is designed to provide spiritual fortification for officers who are faced with a barrage of experiences in the course of their careers which challenge their most deeply held personal beliefs. Jam-packed with exercises, tools, and insights, this practical guide restores inner peace and clarity. 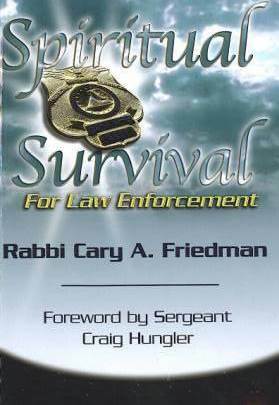 A 'must have' for all new and seasoned law enforcement officers!" "The events of 9-11 proved that our spirits are larger than we ever imagined. We can do amazing things--collectively and individually. This small book gleans wisdom from the ordinary and extraordinary, offering simple reminders of powerful actions that produce resilient results. (This book can be customized and delivered in bulk for the employees in your company. Contact Eileen McDargh.)" Expression of one's deepest thoughts and feelings has long been a staple of psychotherapy. Yet until Dr. James Pennebaker of the University of Texas published the results of his decades-long research program, little was known by the general public about the specific effects of self-disclosure. Dr. Pennebaker shows how writing down your thoughts and feelings (or dictating them into a tape recorder) can improve your physical as well as your mental health. In other words, it is not always necessary to confide in another person to obtain at least some of the benefits of self-expression. However, as the author makes clear, not all forms of self-disclosure are beneficial, and he gives specific guidance on what to do and what to avoid. Over 2000 essays were submitted by school children nationwide after September 11, 2001, and Ms. Kellar selected the best of the best to share with readers. The stories are warm , funny, touching, tragic, poignant and powerful. Proceeds go directly to a scholarship fund for children whose parents died or were disabled in the terrorists attacks of that day. Order from the National Institute for Trauma and Loss in Children, or call toll-free: 877-306-5256. Brave Bart teams up with Helping Hannah to create a story book and hand puppets for helping children cope during trauma. Check out some of the other book offered at this site. Foreword by Bernie M. Siegel, M.D. Who survives? Who thrives? As a psychologist who has spent more than forty years studying the phenomenon of survival, Al Siebert has gained valuable insight into the qualities and habits that help human beings overcome difficult situations--from everyday conflicts to major life stresses. In this book, he delineates the "survivor personality"--including such recent examples as Scott O'Grady, the fighter pilot shot down over Bosnia--and shows how survival skills can be learned, leading to better coping, increased success in work and relationships, and a vastly brighter outlook on the future. Includes Index, Notes and References and Reading List. Read more about The Survivor Personality and read Chapter One online at Practical Psychology Press. Order from National Institute for Trauma and Loss in Children. An excellent reference for all those working with children. It identifies differences between trauma and grief reactions. A children listen to you describe these reactions they see you as someone who truly understands their hidden fears, terror, and confusion. Once this understanding is established, they find it easier to confide in you. $6.